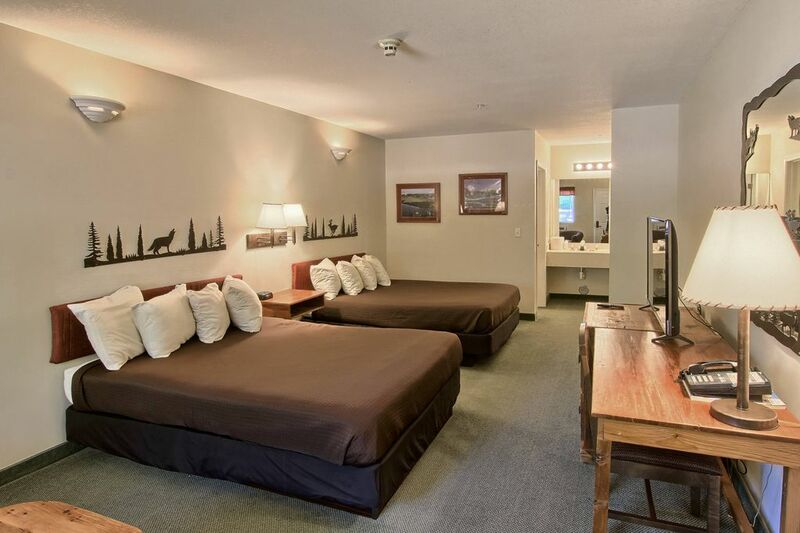 Our guestroom has two queen beds,small desk w/chair, two comfortable chairs w/small table, TV, coffee maker, mini-refrigerator, microwave, alarm clock, bath, and air conditioning. The room is clean and comfortable. WI-FI is provided at no charge. If you are staying more than one night, a housekeeper will come in each day and freshen up your room by making the beds, removing the trash, leaving fresh towels, and coffee. The Inn is also located next to the outdoor seasonal pool which is open from Memorial Day through Labor Day. We offer discounts for AAA, AARP, Seniors, and active or retired military. We DO NOT charge a cleaning fee. Bathroom is equipped with tub/shower combo, sink, hair dryer, iron/board. The Legend Inn is a short 2 mile drive to downtown Bellaire which has Short's Brewery, movie theater, Lulu's Restaurant, Bellaire Bar,and small quaint shops. The Legend Cottage Inn is located at Summit Village at Shanty Creek Resort. It is extremely close to the hills at Summit Village as well as the Lakeview Dining Room, and Fitness Center and Spa. Many rooms at The Legend Cottage Inn have a view of the Summit Golf Course at Shanty Creek. Houskeeping will provide fresh towels, coffee, and garbage removal everyday during your stay at no additional charge. The Legend Cottage Inn offers free WI-FI to Inn guests. Fresh towels are provided everyday at no charge. Mini-fridge provided in every room. Microwave provided in every room. Small table with two chairs is in the guestroom. The Legend Inn is located within walking distance to the ski hills at Summit Village at Shanty Creek. It is a short drive to Cedar River and Schuss Mountain. Numerous golf courses located nearby including Hawk's Eye, The Chief, The Legend, Summit, Cedar River, and Schuss. Heated swimming pool with bathhouse including private changing rooms and bathrooms. Open from Memorial Day through September 30th. There are so many choices for things to do! If you choose to venture into the village of Bellaire, you won't be disappointed. Short's Brewing Company is right downtown. Not only do they have 19+ beers on tap, the menu is extraordinary. They create the best food with local ingredients and have some of the friendliest people you will ever meet. The local movie theater has two screens and offers new releases weekly. Grass River Natural Area is a short drive and offers hiking trails, nature walks, education and learning areas, and wildlife viewing. Venture a little further, and you will come upon the small town of Alden. If you are looking for a day of window shopping, Alden is for you. Alden Millhouse has everything you could want for the cook, baker , or kitchen gadget collector in your life. The staff is friendly and helpful. The room was as described. I’m sure the view in the summer is spectacular because it was pretty in the winter. Thank you for being our guests. We strive to treat our guests like family. The view is great in the summer - please come back and see for yourself! My son and I stayed one night and the experience was fine. This was just a small motel room; we really expected more at Shanty Creek. Also, the window air conditioner was malfunctioning; it was releasing odors into the room from a old filter or a coolant issue. Once we turned it off, there was no issue. Second, carpet was dirty and the front door weather-stripping was coming off. Again, not what we expected at a 1st class resort. We are disappointed to hear that you were unhappy with your guestroom. We certainly would have moved you to another room if you had called and let us know that there was a concern. Thank you for your comments and we hope that you will consider returning in the future. There are so many choices for things to do! We are located right at Summit Village at Shanty Creek. We are close to the skiing and tubing hills. If you venture into the village of Bellaire, you won't be disappointed. Short's Brewing Company is right downtown. Not only do they have 19+ beers on tap, the menu is extraordinary. They create the best food with local ingredients and have some of the friendliest people you will ever meet. Lulu's Bistro is right down the road from Short's, and offers casual dining with locally sourced food, and a top rate affordable wine list. The local movie theater has two screens and offers new releases weekly. Grass River Natural Area is a short drive and offers hiking trails, nature walks, education and learning areas, and wildlife viewing. Venture a little further and you will come upon the small town of Alden. If you are looking for a day of window shopping, Alden is the place for you. Alden Millhouse has everything you could want for the chef, baker, or kitchen gadget collector in your life. Other shops include Carter's Candles, Alden Outfitters, Curosities Antiques, LaVoix Designs Fashions, Nifty Things, Spencer Creek Trading Company, The Warm Fuzzy, Winter Workshop, Redeye Gallery, and The Pear Tree. After a full day, relax and enjoy a good meal at the Alden Bar and Grill. If you are up to more exploring, we are 40 minutes from Traverse City, Charlevoix, and Gaylord, We hope you will take this opportunity to give us a call or send an email. We welcome you to enjoy this beautiful area we call home. The Legend Inn is not owned or managed by Shanty Creek Resorts. Guests arriving after the Check In Center has closed will need to use the after hours key box to obtain keys and a map to the unit. Please call the Check In Center at least 48 hours in advance of your arrival if you anticipate needing to use the after hours key box. We will then give you the instructions to obtain your keys and map. The Check In Center closes at 6pm Saturday through Thursday, Friday at 8pm (October through April) and Friday at 10pm (May through September).